Jessika Le Corre’s passion for plants is deeply rooted. She spent her childhood playing in the woods, trees and mountains, mashing up wild flowers and plants to make her first ‘potions.’ She studied herbs, flower remedies, essential oils and plant medicine with a renowned shaman in Peru, known as the Master Shaman Chononita, and is soon to become a certified Master Herbalist herself. In 2014, she created Feather Eagle Sky, a plant based, organic, wild harvested beauty line, named after her 3 children and based in the luminous city of Santa Fe, New Mexico. Jessika shares the cathartic healing and transformation that she experiences in her life as she journeys deeper and deeper into nature and into herself. Jessika Le Corre: My name is Jessika Le Corre. I am the mother of three diamonds Feather, Eagle and Sky. I’m a poet and the author of Moonbow. I’m a lover of Mother Earth and happily married to the love of my life! My love for Source and my immense gratitude for Mother Earth since I was a child have manifested in my marrying a man with whom I sit in ceremony around the world, in working with plants, owning a business that honors Mother Earth and sharing potent messages through my book on beauty and true radiance. My husband does the same work through natural movement and we travel the world with our kids teaching them about other cultures and traditions. Tell us more about Feather Eagle Sky. Feather Eagle Sky was born a month after the birth of my 3rd child, Sky. I wanted to share with the world the sacredness of caring for self through the use of oils, creams, and herbs. I wanted to share some of the treasures I've found along my travels, that also honor the Supreme Source of all beauty and wisdom: Mother Earth. Today, we are seeing women and men bringing back the old ways of ancient whole health! Tell us about the creation and fabrication of your products? How do you source your ingredients? Everything is made with the highest intentions, that’s the beginning. Then during my travels, that include a lot of spiritual work, I will sit in ceremony with plants until an intuition comes up. From there, something comes out of it - like a new cream or tea. Lots of the plants come from my land in the mountains of New Mexico, sourced from the best top soils and oldest farms around the world, Peru, Corsica, France, Morocco, from tribes and small villages. What is the aspect of your product your customers like the most? I believe they feel my love - my love for the feminine, my love of woman, my love for skin as the radiance of our temple, the master plants that are used, the ceremony and prayers from which they are created and used. The realness of my creations and the wisdom. The 1st hand care that comes with each package like, real petals. And then how healthy and glowing their skin is after just one use. What do you consider to be the needs of your new generation of customers? As time moves on, we continue to awaken to the distress of our planet resulting in various toxins, like pollution, that causes such stress to the skin and body, I believe the new generation wants cleaner products that cause less damage to the environment. More and more people are coming to a spiritual empowerment, rising up through caring for the planet and how this starts first with self. In essence how you care for yourself and what you choose to use matter immensely. Feather Eagle Sky is a way to reclaim pureness. What does your brand offer to help with the chronic problems that concern so many of us all in this hectic, over saturated and demanding world? Through the sacred creations, precious oils and master plants, my brand offers a moment of ceremony, a pause and a way to go within for a moment and reconnect. 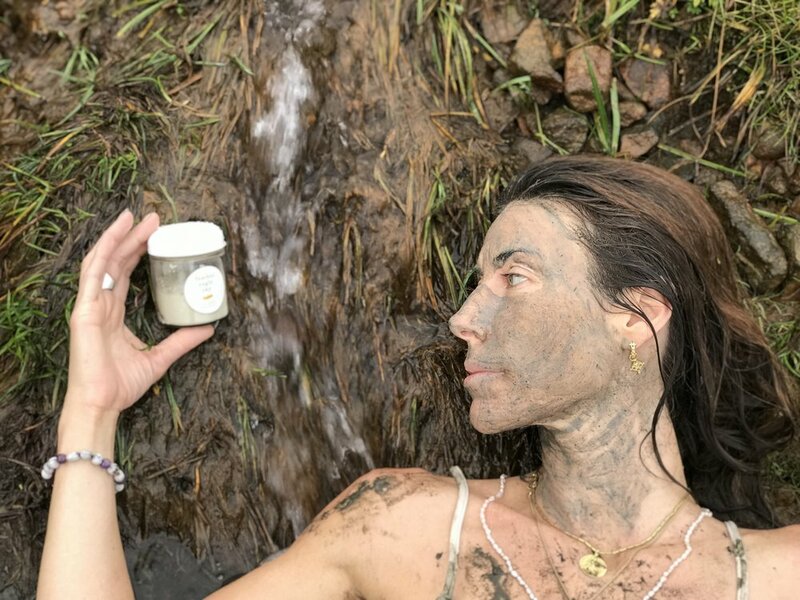 Inhale the cosmic aroma, learn to love self through the process of care and with the knowledge that these products are pure and sourced from such sacred places, full of beauty. This contact with Mother Earth can bring more clarity to our highest self. How do you think the beauty and health industries will evolve in the coming years? With the current population and pollution levels, the need for clean products, and the global cry for Mother Earth, I believe more and more people will raise the vibration of health and the preservation of ancient wisdom. We're on the precipice…. Demand first from self a higher respect for living and for all the gifts, then live by that. And support companies and people that care for the planet. Growing up in a small mountain village how has this effected your lifestyle and views on wellness? The mountains were I grew up were valuable in forming my younger years. It was an unbelievable expanse filled with forest, rivers, meadows and fields of endless wild flowers. It was in this sky house that I could dream, write, play, run, harvest plants and watch the stars. This provided me with the tools I would need to be strong, wild and free. The use of plants goes back to antiquity. Wisdom and teachings of Sumiruna, shaman, and sages have influenced our understanding of metaphysics and science down to our present day. Plants are the key to the mystery of life - they hold the monopoly of all life, they provide food, oxygen essential to all life. All life is dependent on plants, without them we cannot survive. Our civilization has much knowledge and material wealth, but it does not have wisdom that comes from living in harmony with the natural world. May humanity begin to learn from indigenous peoples; who, when left alone, live in balance with nature and protect and honor this magical earth. May we seek mastery of LOVE, understanding, connection, and discernment; may we once more be a people who are educated in the supreme wisdom of nature; in which science and evolution go hand in hand. May we rise up and seek beauty... without exploitation or greed. Tell us about your book Moonbow. Moonbow is an offering of love letters to Mother Earth. Potent messages and gems that point to the highest radiance, Spirit. Plants. Nature. My family. I spend most of my time deep in nature with my family or alone. My community and family includes the Shipibo of Peru (editor’s note: indigenous people along the Ucayali River in the Amazon rainforest in Peru) as well as dear friends, old and new, who hold so much wisdom. Who are what helped you get where you are today? God. Everyone and Everything! Following my innate wisdom, trusting myself. Trusting in the Universe, Source. Taking opportunities, lots of travel, seeing how others live, being rooted in Mother Earth, in ceremony, prayer, and listening. Saying no a lot! Lots of discipline. Lots of learning and remembering, and faith. Love is powerful. I am so grateful for all the love in my life - it fuels everything I do. Helping others in the end is the greatest gift you could ever experience. Overall who takes care of you? Who or what makes you stronger? The Universe has given everything I need to live my highest self. Ceremony with plants, climbing mountains, silence, serving others, meditating in ice cold water, my husband and kids, seeing things for what they are, being deep in my visions, prayer, impermanence, and traveling to remote places working with tribes, becoming more skilled in all aspects of life. Seeing how little most have and how happy they are makes me stronger. The constant need for simplicity and realness. Service, kindness, selflessness and tolerance - this is true strength. Do you face any particular challenges or obstacles? I think the more one really sees oneself, the clearer the path gets. What particularly challenges do you feel women are facing? And how can this be improved? Women's empowerment and achieving equality. When we honor WOMAN then we honor all life! Women being paid equally, women having the rights to decide how or where they want to give birth, having access to opportunities, financial independence, within and outside the family home, education, skills for personal self worth... An empowered woman contributes to the health of her family, community, and country. Woman is the embodiment of Mother Earth - she is Sacred! As a woman and mother of three, wife, business owner and author I wouldn't be able to do it all so gracefully without the immense respect and honor I receive from my husband. Many of the older women I search out and travel far to sit with and learn from are the ‘Maestra’ of the village. These women are the bosses. They not only care for twenty other members of the tribe, but cook with real fire, sweep the entire jungle floor, teach, wash everything by hand and are always gathering some kind of wild food, making plant medicine, and then they hold Ceremony all night. These women are respected by all, including the men of the village. They honor Mother Earth, and so clearly they honor women. Our modern world has lost touch with the wisdom and true beauty that a woman is. I believe that the more man honors life and creation, the more he will honor women. What are your thoughts on female empowerment and feminism? When woman develops her spiritual powers her words and energy become songs flowing like rivers, her joy and beauty as majestic as trees, her sublime healing and teaching, her union with the natural world wisdom, empathy, and consciousness unfold. Woman is the creator and preserver of all life. What resources would you recommend to our community? Including those people without means or geographical access to prestigious materials, products and practitioners? Any books on wild plants. My husband’s business: ‘Natural Movement.’ Getting outside! Everything you need is outside, and within! Nobody's perfect. do you ever fall off the wellness wagon? And if so how do you get back on track? I think sleep is hugely underrated. No amount of herbs, tonics or creams will do for you what sleep can, so I make sure to get deep rest. Tell us about your rituals? I go to bed early. I love to dream and my dreams are just as powerful as my visions in ceremony. I wake before everyone, make tea with herbs I've wild harvested like nettle, rosehip, elderberry, osha, rose and yarrow. I go outside on our land by the stream and sit in silence. I give thanks for everything. I pray and then I stretch, make breakfast for my family with local ingredients from local farmers, or from our land. I often do an extended cold water immersion in our stream or go soak in hot springs while getting in and out of the cold river. Cold is a fierce teacher. I've been cold water immersing since a child and am addicted. The cold clears the mind, reduces inflammation, makes skin glow... I also sweat in a sauna three times a week, sweating is prayer. Fast. I fast the entire day and days before ceremony. I dry scrub every morning. I don't like to shower so I always take a bath with rose, holy basil, fresh yarrow, calendula, immortelle, neroli, frankincense and sea salt sourced from the sacred valley of Peru. I run and hike everyday, and have sungazed every evening for over eight years. I can often be found perched like a bird or a puma on a cliff somewhere. Getting to the top is the best high, sitting for hours deep in meditation, then racing down the mountain like a gazelle and drinking spring water. That's a ritual all on its own. Ceremony with my husband twice a week. On full and new moon I do a mask. I offer my moon blood to my plants. I always wash my face before bed and lather up with oils all. I drink my tea and then a big glass of water. Sunbathe outside almost everyday. The sun is essential for health and happiness. What role does travel play in your life? Where have you been and what's next? I need to travel. I love this magnificent planet; so much beauty blows me away. I feel the most me when I travel no matter where it is. I love to try new foods, to meet new people, to learn new skills, to speak to someone else in another language. I love not knowing anyone. I love adventure. I believe so much of the pain we experience is the disconnect between us and others, judging people and the way they live… Traveling gets you in touch with humanity! I've been to so many places: Corsica, Spain, Italy, England, Iceland, all over France, Abu Dhabi, Oman, Nepal, India, all over South America, soon back to Peru. My next stops are Tulum, Hawaii, and then Israel and Egypt! Oh my goodness people who really know me love to jam with me! My dad is an amazing guitarist. I grew up with some pretty big badass people coming to play with him. I sang as a young child winning the talent contest every year. I performed for the Prime Minister of India with a world known band. I sing every day and in my ceremonies. I am always dancing and singing with my kids. I usually sit with it in ceremony, send it love, or feel whatever needs to be felt and let it go. On a sailboat with my man and kids watching the sunset, eating something fresh caught, laughing, kissing and so proud of all the amazing places we've been, all the incredible people, and the togetherness!